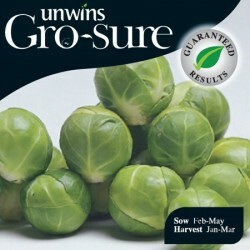 Brussels Sprout Petrus is suitable for late harvests in the winter period between January and February. With good frost tolerance this variety of brussel sprout produces a uniform crop of dark attractive buttons. Petrus is an excellent variety to grow in gardens in the north of England and Scotland. Our community of gardeners have a wealth of experience, beautiful garden and great photos, discover more on the following pages: winter vegetables, grow your own.